Typhoid fever is an acute infection of the small intestine. The causative agent is Salmonella, which enters the body through food or dirty water. Characterized by faecal-oral transmission, so you can become infected not only from products but also from a sick person or a carrier of the bacteria. To diagnose an intestinal infection that uses several basic techniques. These include studies of biological fluids of the human body in various ways. Once in the digestive tract, bacteria begins to proliferate actively. The incubation period lasts about 2 weeks, after which symptoms steadily growing. Often the primary symptoms can be considered intestinal manifestations that make themselves known within the first few days. Very often there are outbreaks of typhoid among a certain group of individuals: employees of the same service or kids who attend the kindergarten. This becomes the main reason to conduct a thorough and timely diagnosis. Common signs of intoxication. After infection there has been a steady increase in temperature, the body is weakness, typhoid, the patient feels nausea, no appetite. Indigestion. Nausea, diarrhea and vomiting occur in the first days of infection, accompanying the patient throughout the illness to recovery. Nervous manifestations. This symptom is caused by the fact that Salmonella invades the nervous system and, therefore, observed depression, confusion, apathy. The victim might wander, hallucinate. These characteristics distinguish typhoid from other gastrointestinal diseases. The failure of the cardiovascular system. The condition worsens due to a rapid fall in blood pressure. The rhythm of the heart becomes weak, fuzzy. Such symptoms may cause oxygen starvation of the brain and all body tissues. If increased the liver or spleen, the patient will feel discomfort in the hypochondrium. Ingress of Salmonella into the respiratory system provokes cough, shortness of breath. In some cases, develop pneumonia. The presence of all these symptoms is sufficient cause for a thorough diagnosis. As a rule, affected with these signs hospitalitynet to the hospital for further tests. Self-medicate to deal strictly prohibited. This becomes dangerous not only for the sick with typhoid fever, but for his entourage. Accurate diagnosis can put only a doctor, after all laboratory studies. To detect the disease made a careful survey and examination of the patient, is assigned to a clinical examination, serodiagnosis of typhoid fever and bacterial analysis. Also conducted a differential diagnosis to exclude other diseases that have similar symptoms. The survey is one of the main components of the survey. It is conducted by two physicians: infectious disease and gastroenterologist. It is important to establish the exact date of infection. Often the patient thinks he is sick when the typhoid fever was already under the height. Therefore, for correct diagnosis it is necessary to recall the man’s actions a few days before he became ill.
swam in any body of water. Also important information for the doctor becomes a story about a recent trip, if it was. During the interview, the specialist identifies the circle of persons who had been contacted infected with typhoid fever. This is to prevent further infection of other people. The inspection will also help to assess the victim’s condition. A characteristic symptom of typhoid is a swollen tongue, which revealed the white coating and teeth marks. Visually on the peritoneum, you can see a rash that fades when pressed. Enlargement of the liver and spleen diagnosed by palpation. Infectious diseases drew attention to the condition and behavior of the patient. If you have a place to be psychological manifestations with increasing temperature and diarrhea, typhoid, becomes a preliminary diagnosis. The full clinical picture can be obtained after analysis. 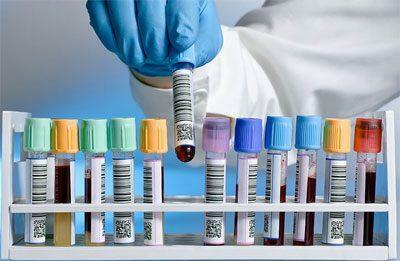 Laboratory diagnosis of typhoid fever includes carrying out a General analysis of blood and urine. When infected with Salmonella in the blood is a sharp increase in white blood cells, then there is leukopenia, that is, reducing them to low levels. There is a lack of eosinophils, increased erythrocyte sedimentation rate, a slight. When infected with typhoid fever, the urine contains a large number of red blood cells, protein and cylinders. Bacteriological method of diagnosis of typhoid fever includes examination of blood, feces, urine and bile. The essence is to apply a small amount of biological material on a nutrient medium and dip it into thermostat which constantly keeps the temperature at 37 degrees. After a few days, if the body is present in Salmonella, it forms colonies that can be identified under a microscope. Sowing microflora of bile is carried out after full recovery of the victim. This helps eliminate chronic carriers. Most quickly the research will give a positive result if to cultivate bacteria from the blood. Feces and urine are rife with Salmonella after a week and a half after infection. If you suspect damage to bone marrow can also investigate the method of bacterial analysis. The widal reaction for typhoid. Determines serum O — and N-antigens. Blood cells are mixed with a special substance, and then strongly glued, dyed in the form of sediment. The reaction will be observed not only in a patient who is ill, but chronic carrier or person with a history of vaccination against typhoid fever. 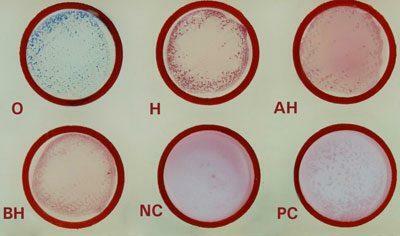 Therefore, to detect the growth and development of bacteria such analysis is carried out several times. Passive hemagglutination. During the study, can occur as the red blood cells glutinious, that is glue their cells affected by the bacterial antigens. The antibody titer can be observed only in the dynamics, so the analysis is also carried out repeatedly. Differential diagnostic method helps to distinguish typhoid fever from other diseases with similar symptoms. It also plays a huge role in its subsequent treatment. Thanks to the methods of diagnosis of typhoid fever difficult to diagnose at the earlier stages of the disease, which affects the quality of further treatment. Correct formulation of the diagnoses in the majority of cases ensures complete healing of the patient without the development of subsequent complications.